The set designers also constructed the four-story loft building to the north, along with a newsstand and a ghost sign. And in the third photo below, note what the Atalanta building at 25 N. Moore looked like before its windows were (re-?)added. Atalanta was built mostly windowless, for refrigeration. 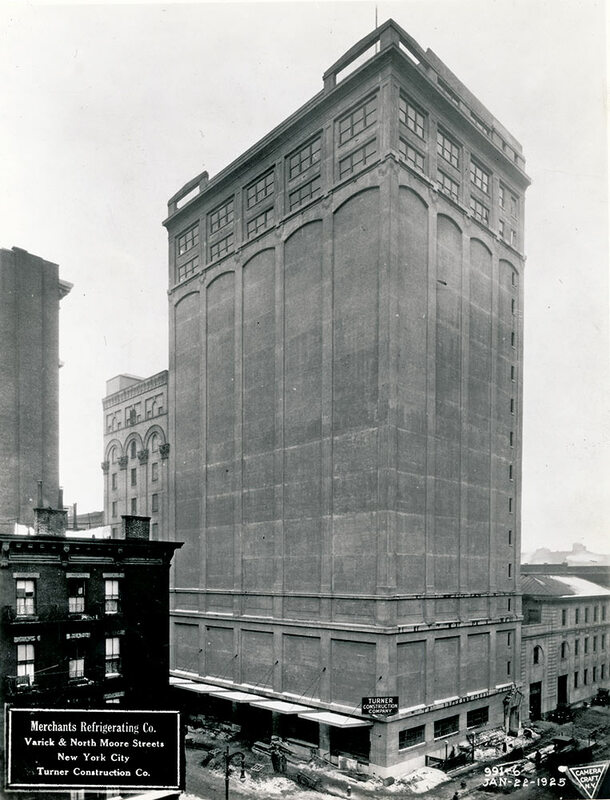 “Designed by John B. Snook Sons, Architects in an Industrial Style and constructed in 1924 for the Merchants’ Refrigerating Company in reinforced concrete. Thanks for the great pictures! I remember this—we saw it after it was finished we were disappointed when we realized it was fake. In those years I was rollerblading on the part of the esplanade that was finished, and one morning a hot air balloon floated down the river and there were boats and divers waiting for it to land in the water near Rockefeller Park. It turned out to be used in a scene in the same movie. My bearings are all turned around it seems. This is where 1 N Moore is, yes? Wasn’t that lot also turned into a Gas Station for Zoolander? I remember that! I remember asking someone on set what the movie was called and he said, “Cop and a Waitress.” Kind of wish they’d gone with that. The older 19th century buildings had classic design look. i remember this. I thought it was great. the movie set was on a parking lot but the parking lot had not been there long. in the 1980s, there was a 18th century farmhouse on that lot. the house was torn down because the area was about to be land-marked. apparently, the owner was afraid that land-marking the structure would lower the value of the property so they tore it down. this sadly was not an uncommon practice. another 18th century house was razed on hudson street near bubby’s for the same reason. I doubt there was an 18th century farmhouse there in the 1980s, especially since it was apparently not there in 1939.
wow, thanks for finding those photos! clearly, i’m wrong. i think what i remembered as an 18th century farmhouse is the building with the barbershop at 246 west broadway. that building dates from 1910. i believe that the three story green thing that’s on the lot now is newer. just so you don’t think that i’ve totally lost it, here’s an article with the history of the 18th century farmhouse on hudson street that i referenced.